Using different tools, Merel will demonstrate the importance of awareness, focus, embodiment and energy level in rehearsals and concerts. This way the choir members feel more united and responsible for the music! 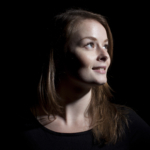 Merel Martens is a choir leader, arranger, teacher and coach. In May 2015 she received a Master’s degree in ‘Vocal Leadership’ from the Royal Academy of Music (DK), studying with Jim Daus Hjernoe. Merel’s name is connected to the award winning vocal groups “Pitch Control”, “MAZE” and “VOÏSZ Vocal Projects” in the Netherlands. In addition, she is vocal coach for the professional groups “The Junction” (NL), “Perpetuum Jazzile” (SI), “Vocalocity” (IL) and “The Keystones” (FR). In September 2014 Merel founded the “Dutch Organic Choir”: a group based on rotated leadership and style-free original, partly improvised vocal music. Since November 2015, Merel has brought the ‘Intelligent Choir’ method to two Dutch conservatories, educating choir leaders during courses and a master’s degree in this fairly new discipline.